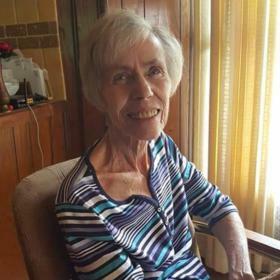 Mrs. Jean Marie Whalen, age 87, passed away peacefully surrounded by her family on December 15, 2018 at the Leila & Cyrus Poppen Residence in Muskegon. A lifelong Muskegon resident, Jean was born on November 27, 1931 to Leonard and Genevieve Pedler who preceded her in death. Jean was married to Bob Pennell and Tom Whalen, both of whom also preceded her in death. As a child of the great depression, hard work came naturally to Jean. She exemplified that through her work as a secretary for Browne-Morse Corporation and American Coil Spring. She worked 40 hours a week, raised four kids, put dinner on the table, encouraged, hugged, disciplined and made it look easy. Jean was a woman of incredible strength, grace and humor and she passed along those characteristics to those who survive her. She had a gypsy spirit and travel was in her blood, especially to exotic locations like Mexico, Las Vegas, Hawaii and Ruby Creek. And Jean saved her best adventure for the last. Having left Alzheimer's behind her, she now has a clear-eyed view of each spectacular sunrise from a great vantage point. We will miss her greatly, think of her daily and feel so fortunate that this amazing woman's love lives on in our hearts. She is survived by her children, Sandy (Mark) Shields, Marci (Terry) Batchelor, Rob (Sharon) Pennell and Rick Pennell. She is also survived by her grandchildren, Christy Shields, Jamie (Adam) Cushman, Ashley Shields, Josh Batchelor, Heather (Chad) Lee, Maggie (Johnny) Pinjuv, Bob Pennell and Ezekiel Kinney, as well as, seven great-grandchildren. Jean's spirit of fun will be remembered by a celebration of her life on Thursday, December 20, 2018, 12:00 PM - 3:00 PM at the Fruitport Eagles. Wednesday, from 6:00 PM to 8:00 PM at Clock Funeral Home - Muskegon. MEMORIAL: In lieu of flowers, please consider giving to Harbor Hospice Foundation. Please visit www.clockfuneralhome.com to leave a memory or sign the online guestbook.